With the days getting longer, and more importantly brighter, you could be forgiven for starting to consider the idea of hatching out of hibernation and stepping outside. This isn’t something that has gone unnoticed at the Strongbow offices. 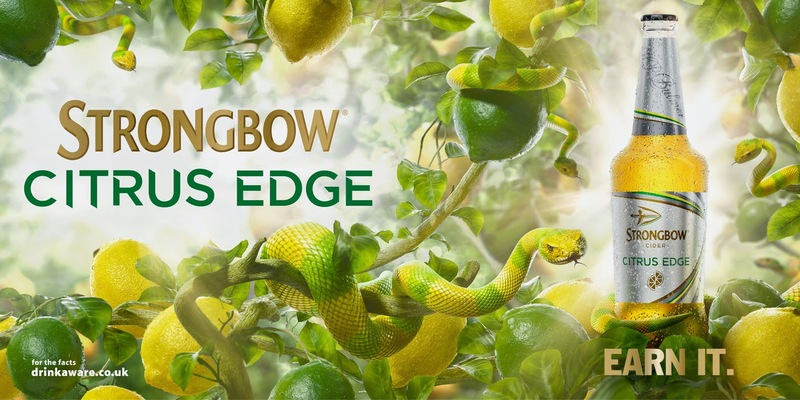 The launch of their new lemon and lime cider variation, Strongbow Citrus Edge, is a perfectly timed move and one that Strongbow believes will create “the drink of the summer”. This variation follows on from the incredibly successful launch of Strongbow Dark Fruit last year. As you would expect from Strongbow this is not a light refreshing tipple to be enjoyed after an afternoon lazily dipping your toes in the paddling pool. This is a light refreshing tipple to be enjoyed after a hard afternoon EARNING IT. Establishing this principle was the challenge which St Luke’s was set. After months of hard work we came up with the idea of combining the appealing fresh fruit which makes the drink taste great with something a little more sinister. This is reflected in the work as at first glance it appears to be showing the Citrus Edge nestled in a bush of luscious lemons and limes. However, when you look closely you see that there are several vicious looking snakes hiding in the foliage. This is particularly apparent in the animated work, which features eerily life-like movement of the snakes. The entire St Luke’s team is incredibly proud of this campaign as we feel it uses Strongbow’s well established brand messages to tell a new story about this innovative product. However, the ophidiophobics (look it up) amongst us might need to keep an eye out while Bob (as we know him) and his friends are slithering around the nation in their various shapes, sizes and formats.